Here’s the surprise announcement that I have been teasing you about. For many months a few of us have been planning a global convening of progressive Muslim organizations and like-minded individuals from the Muslim world and the West for the purpose of officially forming an umbrella organization - Alliance of Inclusive Muslims or AIM. Joining as Adviser to the Board is Mr. Frej Fenniche, the recently retired Chief of Asia, Pacific, Middle East and North Africa Branch at the U.N. office of the High Commissioner for Human Rights, based in Geneva, who played a helpful role in steering the sessions resulting in the productive outcomes that we had. 2. Freedom of Expression: Advocating for freedom of expression, thought, and conscience, and freedom of dissent. No one should be prosecuted, imprisoned, or detained for political, journalistic, artistic, social, or religious expression. 3. Freedom of and from Religion and Belief: Advocating to uphold the Qur’anic mandate “let there be no compulsion in religion” (Q2:256), and that freedom of conscience is not only essential to all human societies but integral to the Qur’anic worldview of humanity. You can take action to uphold these three principles by taking the AIM pledge on MPV’s Website! We Muslims are sick and tired of radicalism, of feeling ineffectiveness because of our disjointed efforts in countering this menace; of violence against women, and the myriad of human rights abuses perpetrated in the name of Islam. With this coalition, we hope to limit duplication of scarce resources, attain a shared mission and vision, and that collectively, we stand a better chance of securing funding. I have seen many grassroots Muslim organizations doing remarkable work with extremely limited funding. They often do not meet the steep criteria of donors, not to mention the capacity to even apply. AIM will be the body to facilitate and administer funding for its member organizations. We want to thank U.N. Women for partnering with MPV in this endeavour, for its funding of the travel expenses of attendees. More information on AIM will be forthcoming in the coming weeks. The progressive Muslim voice for human rights and social justice. Thanks for your charitable donation! October 15-16: MPV's three year plan is coming to a close and a new one needs to be drawn up. Our Board meeting in NY will be the first time many of our bi-coastal Board members meet in person. MPV’s first fundraiser in NY! Our Board co-Chair Kevin Jennings is opening his home for this exciting evening. 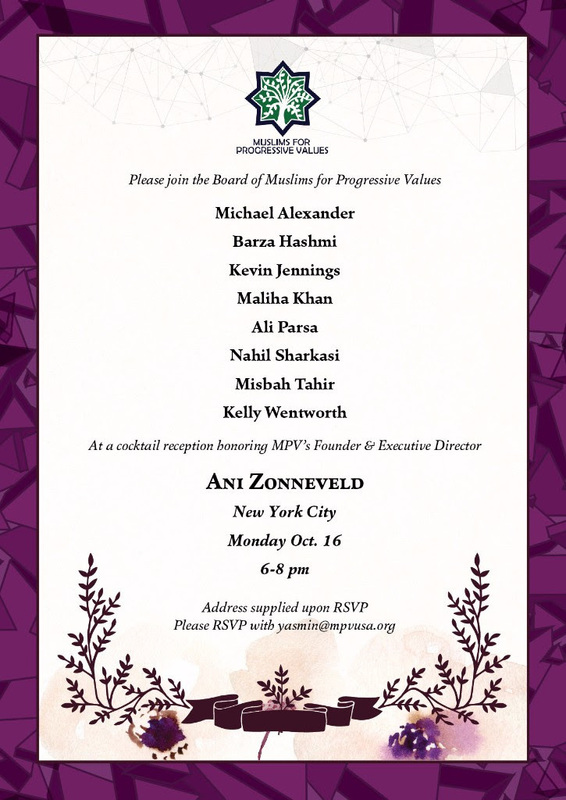 To join us, please RSVP to yasmin@mpvusa.org. Faith and Feminism Dialogue at Ronning Centre at the University of Alberta Augustana Campus, in Camrose Alberta. 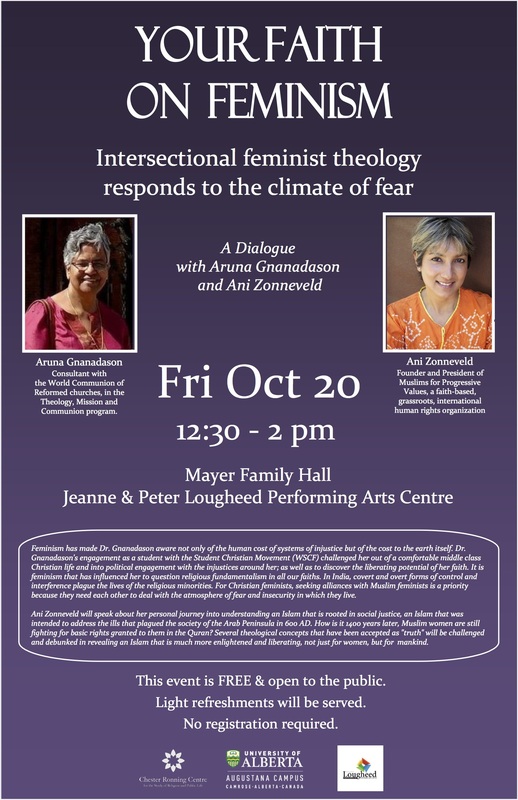 MPV’s Ani Zonneveld and Dr. Aruna Gnanadason are keynote speakers and will discuss the ways in which feminism responds to climates of fear and insecurity. It is feminism that has Dr. Aruna Gnanadason question religious fundamentalism in all our faiths. In India, covert and overt forms of control and interference plague the lives of the religious minorities. For Christian feminists, seeking alliances with Muslim feminists is a priority because they need each other to deal with the atmosphere of fear and insecurity in which they live. Ani Zonneveld will speak about her personal journey into understanding an Islam that is rooted in social justice, an Islam that was intended to address the ills that plagued the society of the Arab Peninsula in 600 AD. How is it 1400 years later, Muslim women are still fighting for basic rights granted to them in the Quran? Several theological concepts that have been accepted as "truth" will be challenged and debunked in revealing an Islam that is much more enlightened and liberating, not just for women, but for mankind. Dr. Aruna Gnanadason and Ani Zonneveld will be giving the WSCF-NA's conference opening keynote at St. Joseph College of the University of Alberta. 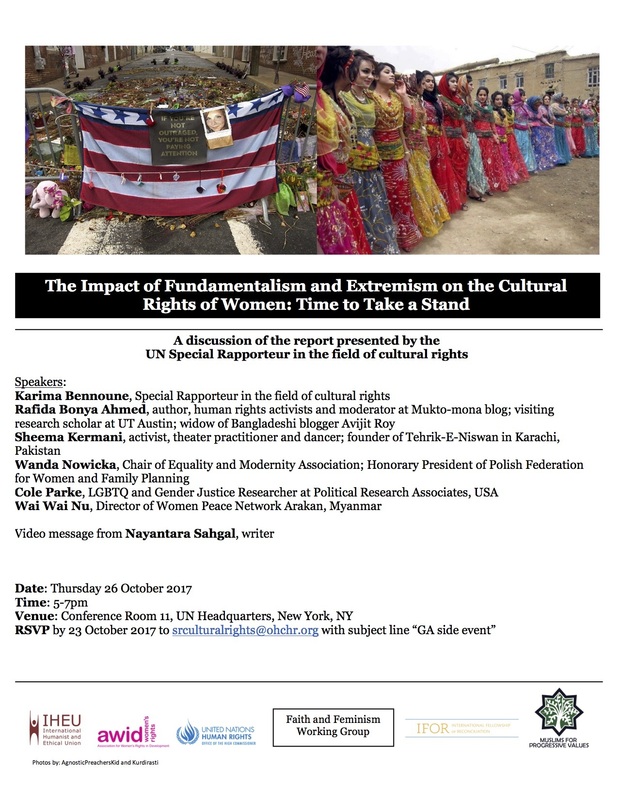 MPV will co-sponsor U.N. Special Rapporteur in the field of Cultural Rights Karima Bennoune’s panel at the General Assembly, entitled “The Impact of Fundamentalism and Extremism on the Cultural Rights of Women: Time to Take a Stand.”. We are proud to have Ms. Bennoune on MPV's Advisory Board, and congratulate her on her latest report titled “Promotion and protection of human rights: human rights questions, including alternative approaches for improving the effective enjoyment of human rights and fundamental freedoms” to be presented at the GA at 10:00 am on October 25. As usual, Ms. Bennoune successfully peeled away the Malaysian government's PR of “moderate Islam” to reveal the true nature of its propagation of radicalism in this report. You may access a copy of Ms. Bennoune's report here. On September 2nd MPV-S.F. held an Eid Al-Adha service at Masjid Qal’bu Maryam. The celebration was not only attended by many local MPV members, but also members of FIrst Mennonite Church of San Francisco. There was music, delicious food, and maghrib prayers were led by Yarehk J. Hernandez Pena, a professor of Islamic Theology at The MECCA Institute, an online progressive Muslim seminary. Do you know what happens when you Google "Muslims" in America? Watch!